Learn the lost art of armor making from Peter Fuller, one of the few modern masters of the craft. Volume 1 covers every step of this project in meticulous detail, including cutting the pieces, shaping, riveting, polishing, and much, much more. The skills taught in this video will not only enable you to make your own historically accurate, battle-worthy helmet, they represent a comprehensive apprenticeship in the armorer's craft. In Volume 2, Fuller builds on the skills he imparted in the first volume, taking you step-by-step through the creation of the smaller, more detailed pieces that make up a pair of hourglass gauntlets. 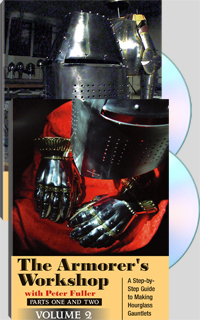 He teaches you how to weld and sand individual pieces into a strong assembly, anneal and shape brass to make it easy to work, chase fine lines into your piece for historical accuracy and polish even the smallest pieces of steel to a mirror finish consistent with the appearance of 16th century armor. Includes full-scale patterns for the gauntlets and specialized armor-making tools, including the fluting tool. Peter Fuller is a former curator of the historical arms and armor exhibit at the Glenbow Museum in Calgary, Alberta, Canada. Through years of painstaking research of authentic period armor, he rediscovered the skills of traditional armorcraft. As owner of Medieval Reproductions, Fuller has more than 21 years of experience handcrafting the highest quality reproduction arms, armor and period accessories for collectors all over the world. For more information, consult his website.